Bentley is the most classic of all British sports cars. Yet ironically Bentley Motors existed as an independent company for just 12 years and only 3034 Bentleys were ever produced. It is also ironic that the most famous Bentley of them all, the 4.5 litre Blower Bentley was a design never accepted by W.O. Bentley himself. And finally it is ironic that the best international result for the Blower Bentley came in a GP race rather than in a sportscar event. Walter Owen Bentley was born in 1888 as ninth of 11 siblings. He started off with locomotives working as apprentice for the Great Northern Railway and racing motorcycles in his spare time before turning to cars in 1910. In 1912 he, together with a brother, bought a company that imported products from a little French car manufacturer known as DFP. Bentley started to upgrade the engines and entered the cars in races to make them better known. Bentley was among the first ever to make aluminium pistons for car engines, and the first to have it in a production car. During the First World War Bentley was busy constructing parts for airplane engines. After the war Bentley sold his firm and with the money he started to construct his own car. In 1919 the prototype was ready. Bentley copied the 1914 Mercedes valve gears and cam drive for the 3-litre engine, while the chassis was a copy of the 1914 GP Peugeot L45. The car got an enthusiastic reception, but it lasted until 1921 before Bentley was ready for production. In 1925 came the 6-cylinder 6.5-litre model, a later racing variant of that car became known as the "Speed Six". In 1927 the 3-litre car was developed into a 4.5-litre variant. Again Bentley used racing for publicity. In 1923 John Duff started with a Bentley in the first Le Mans 24 Hour race finishing 4th. The next year Duff won the race making the Bentley name famous. Through 1927-1930 Bentley cars were victorious four years in a row at Le Mans, with Woolf Barnato making a hat-trick and putting the Bentley name into racing history forever. Of the five Bentleys entered in the 1930 race two had been made outside the factory by Tim Birkin. Sir Henry R.S. "Tim" Birkin was born in a wealthy Nottingham family in 1896. He joined the Royal Flying Corps during WW1, serving in Palestine where he contracted malaria, a disease that he would suffer from for the rest of his life. In 1921 he turned to motor racing, competing a few races at Brooklands. Business then forced him to retire from the tracks until 1927 when he entered a 3-litre Bentley for a 6 hour race. For 1928 he changed to a 4.5-litre car and after some good results decided to become a professional racer against his family's wishes. Soon the little Bentley driver, racing with a blue and white spotted silk scarf around his neck, would be a familiar sight on the race tracks. In 1928 Birkin entered the Le Mans race, leading the first 20 laps until a jammed wheel forced him to drop back, finishing 5th. The next year he was back as winner, racing the "Speed-Six" as co-driver to Barnato. But Birkin had now come to the conclusion that a supercharger was necessary for the car. The Bentleys were huge cars. Bugatti called them "the world's fastest lorries". The wheelbase was 3.3 meters and the weight almost 2 tons. The ordinary Bentley engine (100x140mm = 4.398 cc) produced some 130bhp. With technical help from Clive Gallop and supercharger specialist Armherst Villers and with Dorothy Paget financing the project Birkin rebuilt the car and added a huge Roots-type supercharger in front of the radiator, driven straight from the crankshaft and giving the car a unique appearance. The 242bhp "Blower Bentley" was born. The Blower Bentley first appeared at the Essex six hour race at Brooklands on 29 June 1929. However the car proved to be very unreliable. Bentley himself had never accepted the Blower Bentley. He said that "there was no substitution for cubic inches" and that supercharging a Bentley was "to pervert the design and corrupt the performance". However Birkin somehow managed to persuade Bentley to produce the 50 supercharged cars necessary for the model to be accepted for the 1930 Le Mans 24 h race. At the end a total of 54 Blower Bentleys were built. After a duel between Benjafield's and Birkin's Blower Bentleys and Caracciola's Mercedes SSK at the 1930 Le Mans all three retired, leaving the victory to the "Speed Six" car of Barnato and Kidston. Back in 1925 the energetic motor sports enthusiast Eugène Azemar, who was involved with the Tourist Board in St Gaudens in southern France, succeeded to persuade the Automobile Club du Midi to arrange a Grand Prix race in the region. A great success, the St Gaudens track later got the honor of hosting the 1928 French GP. If they can, so can we, thought the city council in the nearby town of Pau and decided to try to get the French GP to their own town. Pau actually had some GP traditions, as the town held the honour of arranging the first race ever to be called a Grand Prix back in 1901. For the 1930 Grand Prix a triangular Le Mans type track outside the city was selected. Known as the Circuit de Morlaas it should not be confused with the well-known street track in the Parque Beaumont. The French had hoped to run the race to the International Formula but when the response was poor the event was postponed and changed to a Formula Libre event instead. The new date meant that the Italian teams were unable to attend, leaving it to be mostly an internal French affair with 16 Bugattis, 2 Peugeots and a Delage among the 25 starters. Among the top Bugatti drivers can be mentioned Lehoux, Count Czaikowski, Wimille, Étancelin and "W Williams" (William Grover-Williams). A curiosity in the entry list was Tim Birkin's "Blower Bentley" sportscar stripped down to a racing car with headlights and mudguards removed. The race distance was 25 laps on a 15.8 km track making a total of 396 km. Bouriat took an early lead in the race followed by "Williams", Zanelli, Czaikowski and Étancelin with Birkin as first non Bugatti driver in sixth place. "Williams" in a works Bugatti then became the next leader. Czaikowski fell back through the field and Bouriat in the other works Bugatti made a pitstop giving over the car to Chiron. Then "Williams" also had to make a stop for a new wheel. That all made way for Étancelin to advance and he was followed by Birkin, the track with its long straights suiting the supercharged Bentley perfectly. At one third's distance Chiron led followed by Étancelin, "Williams" and Birkin. Birkin's fourth place became a third as "Williams" got engine troubles but then Zanelli, who had made an early stop, came rushing through the field pushing Birkin back to fourth. At lap 10 "Sabipa" crashed and was thrown out of his Bugatti, Birkin only avoiding the injured driver by the slightest of margins. After 11 laps Chiron got problems with the oil pressure and Étancelin could take over the lead and soon Chiron was also passed by Zanelli and Birkin. The Bentley driver used the horn to warn the Bugatti to move over, surely an unique occurrence in Grand Prix racing! With seven laps to go Zanelli made another pitstop and Birkin was sensationally up in second place. While Étancelin with a 2.5 minute lead nursed his Bugatti home to take victory by a huge margin, Zanelli had not given up and was catching Birkin fast. At the flag the margin was down to 14 seconds but it was enough for the British Bentley driver to make Grand Prix history. Dorothy Paget withdrew her support for the team in October 1930 but continued to support one car for Birkin. Bentley lost its independent identity when the factory was taken over by Rolls Royce in 1931. In 1931 Birkin won Le Mans with Lord Howe in an Alfa Romeo. On 7 May 1933 he started the Tripoli GP in a new 3-litre Maserati finishing third. During his pit stop Birkin burnt his arm badly against the hot exhaust pipe while picking up a cigarette lighter. There are different opinions of what then happened. The traditional view is that the wound turned septic. Others say Birkin suffered from a malaria attack. Probably it was a combination of both that proved fatal, as Birkin died at Countess Carnavon Nursing Home in London 2 June 1933. Wonder about the black facemask covering the driver's mouth in the picture? 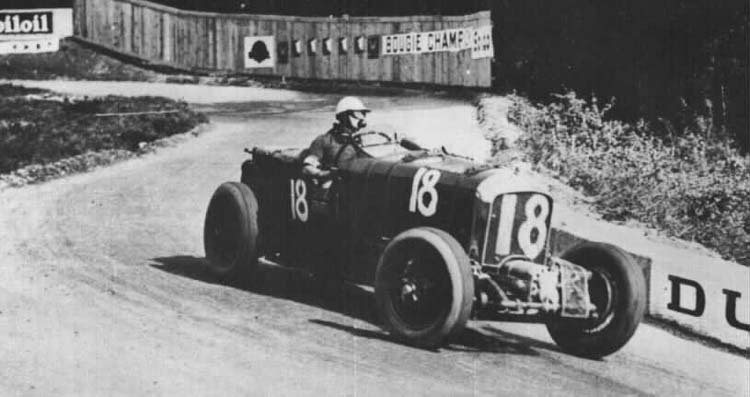 It is Tim Birkin, sucking on an orange while his hands are busy working the steering wheel of his 4½-litre 2-ton supercharged Bentley, navigating this "Battleship" through the "S" curve on his way to second place in the 1930 French Grand Prix. He was the best driver Britain had in the late twenties and early thirties. Tim Birkin's name will always be synonymous with the Bentley cars, which he had driven at Brooklands, Le Mans, Nürburgring, Ards, Phoenix Park, Boulogne and Pau. His friends called him Tim Birkin, but his full name was Sir Henry R.S. Birkin, Baronet, who was born in 1896 and when sixteen built a soapbox car. Tim had no financial worries, had always felt attracted to motor racing. His first race came in 1921 at the Mid-Summer BARC meeting at Brooklands. His race ended when he ran a big end bearing at high speed in his 2-liter French DFP (Doriot, Flandrin et Parant). Birkin also noticed that the DFP's front suspension had worked itself loose and that he had been lucky to escape a serious crash, had he gone further. He decided to spend the next years in Nottingham where his millionaire parents owned factories to manufacture lace. He eventually moved to London but also had a place in Welling Garden City, where his Bentleys were prepared. For years, he did not lack any money and pretty women appeared whenever there was Tim Birkin. Only after the reverberations of the Wall Street stock market crash were felt in England, had he financial problems. Walter Owen Bentley, simply W.O. to his friends, was the English DFP importer and already in 1913, he had made these French cars faster by fitting aluminum pistons. In 1919, he started his own Bentley factory; his first car had a 3-litre 4-cylinder engine with one overhead camshaft and four valves per cylinder. W.O. Bentley built a Grand Prix car in 1922, when the 3-litre Grand Prix formula was in effect. One of his 3-litre cars came second in the Irish Tourist Trophy and one was sent to Indianapolis and came thirteenth. In 1923, Bentley entered one 3-litre four-seat touring car in Le Mans, which came fourth and the one 3-litre Bentley sent to Le Mans in 1924, won the race. The following year, W.O. Bentley entered two cars at Le Mans but neither finished the race. In 1926, three 3-litre Bentleys raced at the 24 Hours with only one car finishing in sixth place. The following year, a team of three Bentleys raced again at the Le Mans, two 3-litre cars and the first 4½-litre and a 3-litre Bentley won the race. At this time, Tim Birkin became a member of the Bentley team and drove in the Six-Hour Race at Brooklands in spring of 1927, where he came eighth with his brother Archie but another car he had driven early in the race came third. In 1928, the 88 hp 3-litre cars were replaced by 110 hp 4½-litre Bentleys. Tim drove the 4½-litre Bentley in the Six Hour Race at Brooklands where he came third. At the 24 Hours of Le Mans, won by a 4½-litre Bentley, he came fifth with Frenchman Chassagne, at the German Grand Prix he came eighth, at the TT at Ards fifth and fifth in the Boillot Cup at the Boulogne. Tim wanted to have a supercharger for his car but W.O. Bentley, the designer, was against this idea. But in 1929, Tim had a supercharged 4½-litre Bentley. He had become part of the famous "Bentley Boys" of which the most outstanding were Woolf "Babe" Barnato, a millionaire, whose money kept the Bentley factory operating for so long, Bernhard Rubin, an immensely wealthy Australian, J. Dudley "Benjy" Benjafield, M.D., a bacteriologist, Sir H.R.S. "Tim" Birkin, Bart., heir of a Nottingham lace fortune, S.C.H. "Sammy" Davis, editor of Britain's The Autocar, Lieutenant Commander Glen Kidston of the Royal Navy, who had a thirst for adventures, the Dunfee brothers, Clive and Jack, Frank Clement, W.O. 's professional driver and others. Tim was in the Air Force during WW I where one of his two brothers had been killed, the other on a motorcycle later in the Irish TT. His father did not support his racing ambition fearing that he should meet the same fate as his brothers and always lived in fear when the last surviving son went racing. Tim was small but well built, handsome and was the most elegantly and best dressed English racing driver, the counterpart to Achille Varzi. He was modest, quiet and shy and spoke with a slight stammer. When racing, Birkin wore a dark blue sports shirt with his spotted scarf, white overall pants with a wide belt and the crash helmet with his old St. Christopher in it. He did not like to drive without his blue and white scarf, which fluttered loose behind his helmet and was liable to blow any moment across his goggles. At one time, he refused to go to a dinner-party before a race because it took place on the thirteenth. This superstition probably had its origin in the fact that his brother had been killed the day after a dinner-party of thirteen and was the first to rise. Birkin was always aware of the importance of careful preparation and held mechanics in high esteem, especially his own mechanic, Clive Gallop and team manager Bertie Moir. In May 1929 Tim retired his 4½-litre Bentley with rear axle trouble at the Brooklands Double-Twelve. The following month came his first great success when he won his first 24 Hours of Le Mans race with Babe Barnato in Barnato's 6.6-liter Bentley Speed Six, a six-cylinder offering 200 hp. At the end of June, he raced with the supercharged 4½-litre Bentley at the Six-Hour Race at Brooklands. In the Irish GP, at Phoenix Park in July, he came third in his 182 hp 4½-litre supercharged Bentley and the following month he came eleventh in the same car with no less than W.O. Bentley as his co-driver/mechanic in the TT on the Ards circuit. At the 500-mile race at Brooklands his supercharged Bentley caught fire and retired after 420 miles. In 1930, the Bentley Motors works team retired from racing after the Le Mans 24-hour race. In March, the millionaires Miss Dorothy Paget, whose interest lay mainly with horse racing, bought Tim Birkin's three Blower 4½-litre cars, including the original which had been changed 1929 into a single-seater and added a fourth production car. Tim thought this was a generous move of hers, which enabled him to run his own team of cars for her under British racing green. It was a good year for Tim. He had great battles with Caracciola at Le Mans and the Irish Grand Prix at Phoenix Park. Then came the French Grand Prix at Pau. The situation in the late Twenties had seen the big factory teams leave Grand Prix racing one after the other. The A.I.A.C.R. had introduced a fuel consumption formula for the 1929 Grand Prix races with the goal to reduce speeds. This kind of formula deterred constructors and organizers and in 1929, only the ACF GP and the San Sebastian GP were held to this formula. For 1930, the A.I.A.C.R. stuck to the same rules with the result that by end of June, the ACF had received no entries for their race and the ACBB, the organizing committee of Pau, was seriously worried. Immediately the ACF decided to move the race date to 21 September and selected a Formula Libre for racing cars above 1100 cc. This meant that the European Grand Prix at Spa on 20 July was to be the only race held to the formula. The starting money for the race at Pau had been set originally at 5000 franc. The ACF had asked all racing drivers to participate. Simultaneously the largest French sport paper L'Auto published an appeal addressed to the French racing drivers. "The Grand Prix of France has to take place and should rise again splendidly because of reasons of prestige in our own country towards the foreign countries. This should be in your personnel interest, which is so sincerely connected with the international automobile sport. Do not hesitate to bring a sacrifice and enter for this great race!" The French drivers could not resist such language. By the sixth of August, they responded by entering a variety of 37 racing cars, most coming from independent Bugatti drivers. The delays to change the date and formula had come too late for foreign entries because Alfa Romeo and Maserati were already committed to other major races in September. The 15,835 km long triangular course outside of Pau was completed just in time and had to be driven clockwise. It was named the "Great Permanent Race Circuit of Pau" but was then used only once for this 1930 event over 25 laps, a total of 395.875 km. The date had been set for 21 September while a total prize money of 300.000 franc was offered. The winner received 100.000 franc, second 40.000, and third 30.000, down to sixth place. Additionally there were group prizes of 25.000 franc for the winner of the classes up to 2000 cc and up to 1500 cc and between 2001 to 3000 cc. There were no less than 17 Bugattis of Type T35B, T35C and T37A. The factory had sent two T35C for Bouriat and "Williams", winner of previous year's French GP and Monaco GP. Louis Chiron was Bugatti's reserve driver. The best-known independent drivers were Juan Zanelli, Count Czaikowski, Etancelin, Dreyfus, Lehoux, "Sabipa" and Gaupillat. A totally unknown driver in a T37A gave his debut in Grand Prix racing; his name was Jean-Pierre Wimille, who later became the greatest driver of the forties. Tim Birkin, who entered his stripped down 4½-litre Bentley with a four-seater touring body, was received with ridicule. Sénéchal came with an 3-year old 1500cc Delage, Peugeot had two old 172R 4-litre cars for Stoffel and Ferrand. Laly arrived with his old 3.3-liter Aries. There were the Montiers, father and son, in Montier-Fords 3.2-liter cars, and Casali with the 1.5-litre La Perle. As of Wednesday before the race, the drivers practiced with their cars on the circuit, the roads were not totally closed but there were already many curious onlookers around the whole circuit. On Friday, the British motorbike rider Simson on a Norton crashed at high speed during practice with a bicycle rider who crossed the circuit illegally and who died the following day. Simson survived the terrible crash. Practice took place without other problems except some incidents on Friday. Stoffel blew a tire at the road junction and Fourny veered in the "S" curve without damage. On the windy Sunday morning, rain fell relentlessly. But the spectators rushed to the motorcycle races and suddenly the sun started to come out. At the start of the motorcycle Grand Prix, it had stopped raining and the roads dried up. The sun was still shining at the time of the Grand Prix for cars. From the 37 drivers entered, only 25 appeared at the start for the 25-lap race. The journalists cleared the start area and moved to the press stand. The engines were all running for the 2:00 p.m. start. The August allotment of starting places had Casali on La Perle, Czaikowski on Bugatti T35C and Lehoux on Bugatti T35B with numbers 4, 6 and 10 respectively, on the front row. Bouriat with the works T35C Bugatti number 14 and Wimille with a T37A number 16 were on the second row. The engines roared and Bouriat's Bugatti went past Czaikowski's car into the lead, Birkin's Bentley from row three made a slow start and Sénéchal's Delage, next to him, was delayed. His engine had stalled and he was push-started 30 seconds later and not disqualified. When the cars completed the first lap, it was Williams in the lead with a lap of 6m41s; he had passed 18 cars ahead of him on the first lap including his teammate Guy Bouriat. The order behind them was Zanelli, Czaikowski, Étancelin, Birkin, Sabipa, Lumachi, Fourny, Delaroche, Wimille and the rest. Sénéchal had worked himself already up to place 15. Lehoux did not finish the first lap because of a broken transmission. On lap two, Williams drove a new record lap of 6m15s, representing a speed of 152,016 km/h. Such speeds had not been seen on a road circuit. Zanelli had passed Bouriat in second place, then came Étancelin who had gone passed Czaikowski, then came Birkin, Lumachi and Sénéchal who was already in eighth place from dead last. Fourney and Delaroche stopped with engine problems. Williams pulled further away, Czaikowski fell back and Lumachi retired with a broken crankshaft. Wimille also retired, walking back to the pits. On lap six, Bouriat, who was 40 seconds behind Williams, stopped and handed over to Louis Chiron, the relieve driver. Zanelli had to stop as well and fell back and Birkin moved up one place. Chiron kept the car in third place closely followed by Étancelin, Williams and Birkin. Behind them was a battle for fifth place between Juan Zanelli and Robert Sénéchal. At the end of lap seven, Williams had to stop to exchange one front wheel, which took 1m20s, and Louis Chiron led the French Grand Prix. French cloth merchant Étancelin had worked himself up into second place and was gaining on Chiron. Williams followed him in third place, and then came Birkin, Sénéchal and Zanelli who was making up lost ground. On lap nine, Williams established the fastest lap in 6m10s, a speed of 154.070 km/h and just after this accomplishment he stopped again to change rear tyres. In their battle for the lead the Bugatti works drivers tore up their tyres. On lap 11, Sabipa, who was really the Parisian Louis Charavel, hit a pile of stones at the corner of Morlaas, causing his car to turn into the roadside ditch outside the corner on the return leg. His Bugatti rolled back onto the right side of the road. Sabipa was ejected through the air and crashed onto the road. He lay in the middle of the road with blood oozing from his head. Only with the greatest skill could the following Peugeot move aside. Sabipa was very fortunate that he was not run over by the next following Bentley. Birkin said after the race that he could not brake in time and his wheels missed Charaval's head by less than two inches. Sabipa was brought to the hospital where serious head injuries were diagnosed. Chiron had led the race for one lap when he had a puncture in the "S" curves and slowly drove back to the pits to change one front wheel. At the same time, he encountered oil pressure problems and thereby promoted Étancelin to first place on lap 12 ahead of Birkin and Zanelli. Sénéchal was now in fourth place. Shortly thereafter Williams retired with mechanical problems. Because of his stop, Chiron became fifth and he drove hard to catch up with the leaders. Due to several pit stops, Williams fell more behind and doubled his effort to make up the deficit. After 15 laps Étancelin led with 1h37m15s, Zanelli was 2m43s behind, Birkin 3m52s, Chiron 3m54s followed by Sénéchal in fifth place followed by de l'Espée, Czaikowski, Maleplane, Stoffel and Ferrand. Birkin, who was ahead of Chiron was an experienced driver and blocked the Frenchman and did not let him past. Chiron stopped again in the pits on lap 16, shook the hand of Bouriat, who took over the Bugatti. Sénéchal was now in fourth, Czaikowski in sixth place. Étancelin remained in the lead ahead of Zanelli and when he made a pit stop for fuel and tyres on lap 19, Birkin passed him into second place. The heavy Bentley was by far the fastest car in the race. The time Birkin lost with his unwieldy car in the corners, he made up on the straights where he whistled through at a speed of 214 km/h compared to 210 km/h for the fastest Bugatti from Williams. On lap 21 Étancelin was 4m20s ahead of Birkin. Sénéchal whose car started to smoke stopped at the pits to find a broken exhaust but the stop had cost him fourth place, now taken by Czaikowski. The Bugatti of Bouriat and Chiron retired on lap 24, Chiron driving, without oil pressure. Étancelin drove the race of his life and would have lost it by a hair because he was almost out of fuel and had a very bad clutch at the end. After he crossed the finish line, his clutch gave in and he had only one litre of fuel left in his tank. Under the great applause of the giant crowd the victor, Étancelin, was lifted out of his Bugatti. Étancelin had displayed a superior driving style because before the race he had explained that he would not exceed a certain speed since it could endanger the tyres. The favorite Williams encountered tire problems. The same happened to Bouriat and Chiron who did not pay enough attention to their tyres when they tried to make up lost ground. Their great miscalculation was to use heavily profiled tyres instead of the totally smooth covers used by Étancelin. At the end of 1930 Birkin entered the 500-mile race at Brooklands and later on established the Brooklands lap record at 133.88 mph. He had also gone to Montlhéry with his single-seater Bentley, lapping at 138 mph. The British Racing Drivers Club awarded him the coveted Gold Star. At the end of the year, Dorothy Paget had to sell her interest. She had done her utmost to support Tim who had to go on by himself. In 1930, he purchased a new 2.5-litre 8-cylinder Type 26M from Maserati for Grand Prix events. After years of financial troubles, Bentley went down in the early summer of 1931 when Rolls-Royce owned Bentley Motors and the name "Bentley". But the year had started out well for Tim Birkin when he came second in the Irish Grand Prix with a 1.5-litre Alfa Romeo entered by F.W. Stiles. He came sixth in his Maserati in the Ten-Hour French Grand Prix at Montlhéry, sharing the drive with George Eyston, since a second driver was mandatory in the Ten-Hour Races. For the German Grand Prix he met again with all the great European drivers and came tenth in his Maserati. He again won the 24 Hours of Le Mans with Earl Howe's 1750 S Alfa Romeo. This was followed by the 24-hour race at Spa where he drove a 2.3-litre four-seater Alfa Romeo with George Eyston to fourth place. The year ended with a win in his Maserati 26M at the Brooklands Mountain Championship. At the 1932 Tourist Trophy race, he finished fifth with the Alfa Romeo and entered his single-seater Bentley in Brooklands for some small races and established a new lap record of 137.96 mph. It is interesting to know that the courageous Tim Birkin who was so fast with the heavy Bentley also harshly criticized Brooklands as "the most out-of-date, inadequate and dangerous track in the world." By 1933, Tim had personal and financial problems, which left him in an unhappy mood and he had lost his normal humour. On 7 May 1933 Tim raced a 8C 3000 Maserati, entered by Bernard Rubin, former Bently Boys teammate, at the 393 km, 30 lap Grand Prix of Tripoli. This was the historic race rigged by Varzi, Nuvolari, Borzacchini and journalist Canestrini so they could split the $400,000 winning ticket with three other ticket holders. Starting from the first row of the grid Tim Birkin, not involved in this collusion, had been in the lead for the first four laps, ahead of Nuvolari, Campari, Varzi and Fagioli. But none of these drivers had to do refueling stops. At half time Birkin was in second place, only 10 seconds behind Nuvolari. Birkin's scheduled refueling stop on lap 16 turned out to take a long time. Because his pit was poorly organized, this may have cost him the race and certainly was to cost him his life. He drove with a short-sleeved shirt and during his refueling stop he received a small burn from the Maserati's hot exhaust pipe on his bare forearm. Birkin joined the race in third place and was unable to make up the lost time. Tim drove his private Maserati to third place, just over 1½ minutes behind Varzi and Nuvolari. After he returned to England, he did not tell anybody about his injury, which he neglected. When Dr. J.D. Benjafield, his former Bentley Boys teammate, heard about Tim having a depression, he met with him and noticed an old bandage on Tim's arm. When asked what it was, Tim said it was nothing. But Benji found the burn to be septic with serious blood poisoning. For three weeks, Benji fought with several other specialists for Tim Birkin's life in London. There were no antibiotics yet in 1930! The efforts of the specialists did great help but in the end, Tim Birkin died of blood poisoning on 22 June 1933 in London. There exist modern statements to the effect that Tim died because he had become too weak to fight off an attack of malaria he had since WW1. Be that as it may, England had lost a superb driver and great sportsman.